I am no longer teaching workshops in schools and I had always thought that when I stopped, I would focus completely on my own artwork. It turns out that teaching and sharing are in my bones. The time I am not spending in schools has given me the opportunity to get involved in interesting community-building projects like Lowell Women's Week Public Art Project and the NH Humanities Council Bhutanese-Nepali Book Project. Instead of this one wall free of shelves being used for display of my work, it is the place where I will try to keep myself together and on track. As I find myself doing a wider range of projects, I have been having trouble with two things: keeping the details straight and committing to multiple things that take place pretty much at the same time. I had been using the google calendar which I like because I could keep track of other family members' schedules easily. However I have decided to go back to tried and true paper for keeping track of things—a big wall calendar and a pad and pen in my purse instead of notes on the iphone. I did keep a running log of tasks to do in a binder on my desk but felt that I needed something bigger and bolder and constantly in my face so I can always see what I need to do both long and short term. 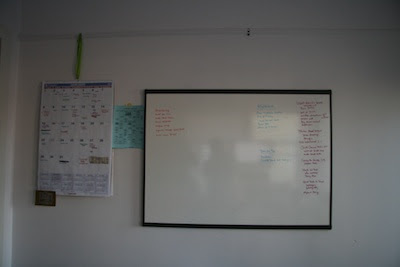 I am trying a big white board on the wall behind my computer. When I am sending an email or talking on the phone, I can turn around and look at it and hopefully not agree to that one more thing that just might put me over the edge. Of course, it's an exciting opportunity I can always take it on but at least I'll have a clearer sense of what I am getting into. We'll see how it works. Leave a comment sharing one of your techniques for organizing your time and be entered into a random drawing for a copy of Art & Fear: Observations on the Perils (and Rewards) of Artmaking by David Bayles and Ted Orland, one of the books on my Artist's Journey Reading List. I do need your email address to let you know if you've won, so please include it. To avoid having it picked up by spammers. you can use (at) instead of the symbol. The Giveaway closes Wednesday, January 18 at midnight. When I turned 50 ( a few years ago now) I realized I needed an extra 4-6 hours in my day to get all the dreams out of my head, turn them into drawings & then into books that I could hold in my hands & share! So I wake up at 3am every day, when the city is quiet & get to work on the drawings or the bookbinding or whatever else is the particular task at hand for the day! My partner is a musician so quite often he is just getting home as I get up but our day job is in garden maintenance to pay the rent and keep food in our bellies so it all balances out one way or the other! Mo (who needs to read Art & Fear, Terri Windling mentioned it on her blog a few days ago along with this quote, " Your job is to draw a line from your art to your life that is straight and clear"
Carving out the extra time has helped me do that! I have a calendar on my computer's opening page. As soon as it starts up it tells me what is happening that day and I can easily scroll through the months and see how things are filling up. So easy while emailing. I now could not live without it. My personal planner, which has month calendars and a tiny year on one page as well as week spreads, has become my time keeper for planning as well as tracking things. I have made a mobile to do list out of the corner of an old envelope - cut into rectangle shape with a fold on two edges. It serves as a bookmark (I slip it over the corner of the page) and I write my to do list on the front for the weekend, then when I turn the page to the next week, I can write down weekly to dos. I love that I can recycle at least part of the junk mail. I have to trick myself into letting go to make art. I am still teaching (junior high art in the morning and art/writing in juvenile corrections in the afternoon), and so I bring along my backpack with art stuff, a book to finish binding, drawings, something, and fine little moments to let go and make art, so when I get home, I can feel freer to keep going. & for the day to day practicalities of running a small gardening business mixed in with the art & music commitments, we always have at least a couple of half days free every week so that commitments can be juggled when a gig or a gallery deadline is happening, a flexible schedule is a necessity. Rod uses an iPhone to stay organized & I use the Moontime Diary that keeps me in tune with what is going on with the Moon phases when I forget to look out the window! I have also come to rely on a DayPlanner. My days are a mix of taking care of an 90 year old mother with Hospice care, a disabled husband and two grandsons. Any day that is blank, is a day I can focus on my art. It is my meditation and sanity in this stressful world. I have tried using the calendar on my phone, but decided a big one on the wall works better for my brain. I like to wake up slowly, too and take the time to think about and prioritize my day in my mind before I start it. I use my Google calendar for all my appts and commitments. I am a jewelry artist, a bookbinder, a freelance writer, and a designer and teacher of "playshops" (we're not working, so why call them workshops?) that help others dive into and explore their creativity. My google calendar has several different calendars for various activities (art, writing deadlines, spiritual commitments, social, etc.) in different colors so I can easily see what's what and when everything is due. I also use the "task" bar for long-term and/or urgent tasks/goals. I refuse to have a phone smarter than myself, so I don't keep my calendar on my phone; that way, I have to check my calendar on my computer before I commit to anything, which actually helps me in planning and in not impulsively agreeing to do something I won't be able to follow through on. BTW, if I kept a paper journal, I would definitely use the corner-of-the-envelope bookmark/to do list! What a great idea! I love those envelope corner bookmarks--we even printed on some a few years ago to use with the datebooks. I love week-at-a-glace--starting my week with Monday, so the weekend is at the end of the week--and for this new edition, we are adding a 2013 planner on a few spreads--i think that's something we will include in future datebooks. Turns out the calendar pattern goes 28 years--so we are making this new edition also a 2040 datebook in case you need to plan ahead.